If you want to drag race in the Destroyer class, you sure can ride them! If you're not a drag racer, it's definitely not waorth giving it a thought. Hoist! 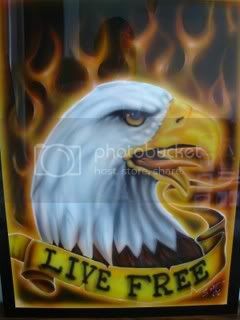 This is true, this bike is strickly for drag racing. I believe it doesn't even come with a warrenty. 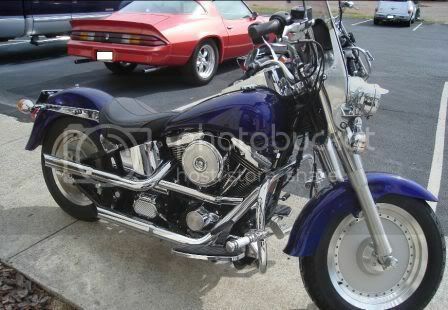 But if you like spending your weekends at the drag strip.........this is the bike to have! Ride safe, and ride often! I Hope one knows how to ride it when they get it. It's Not A Party Unless Someone Gets Knocked Down, Knocked Out, Or Knocked Up. I keep waiting to read that V-Girl has bought one of these. Guess he forgot he's not cruising the local burger joint. LOL. You never know what to expect next!!!!! I actually had one on order. It has arrived at the dealer a while ago. I was not sure if I really wanted to get involved in the weekend warrior thing again. So for now my good friend that owns the dealership is going to keep it and leave it on display. After we get everything settled we may take the plunge. I know she will have a blast on it. Hey Mike, sorry ya missed out on that SE Dyna! Go back and get your Destroyer instead! I am really sorry I missed it also. If I got the Destroyer I have no idea what I would do with it now. It is still sitting at the Dealership. They did ask me if I wanted to take it for a spin around the parking lot. Should'a said yes, took it up to Atco, and met us there yesterday. Had a buncha Destroyers racing, along with TF HD's! Because we ate breakfast, I missed out on putting Cybil in the show. We showed up near the end of ET qualifying. They didn't require safety equipment. Just a full face. I could'a borrowed one of them and raced. Damn! Oh well, I know for next year!!! Might wanna bring the Pro Stret down instead though!!! get the trailer and bring 'em both!